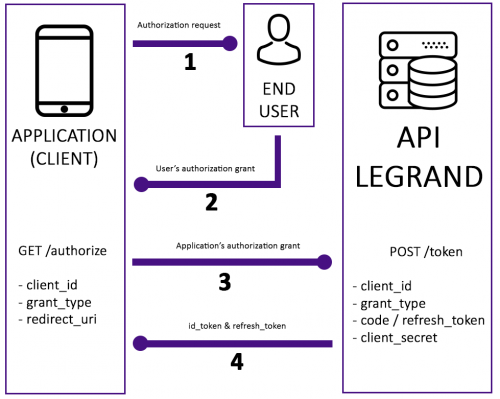 Our authentication mechanism is a standard Oauth2 one. It follows Oauth2 standard and a lot of documentation can be found on internet. For example, you could find documentation on Microsoft site. This flow must be done only once, during account linking. After that, you must use /token flow periodically to get and refresh access_token. state recommended A value included in the request that is also returned in the token response. A randomly generated unique value is typically used for preventing cross-site request forgery attacks. The server returns a code, used with the token end-point. This end point is used to get and refresh the access_token. As the access_token is valid one hour, you must refresh it regularly. The received refresh_token changes at each request. In order to be valid lifetime, you have to use the new generated refresh_token code to refresh your access_token.